A dial made from mother of pearl is true métier d’art, with the entire procedure involving numerous steps embracing artistic techniques. Any timepiece using this enchanting material as a dial truly has an identity of its own. To construct a mother-of-pearl dial watch is also a technical feat, as it is a brittle substance and has to be a very thin sheet when used as a watch dial, imaginably it is easy to break. Now, it just happens that nature has made organic-inorganic composite material an enchanting kaleidoscope of a play colour hues and the Swiss watchmakers are making full use of its natural beauty. Molluscs secrete nacre as a protection for their shells. Continuous deposits in the inner shell form iridescent layers of nacre, or more well-known as mother-of-pearl. In this age where ‘standing apart’ is the new trend, mother-of-pearl dials are much sought after by women watch connoisseurs. Thus, watchmakers indulge and find innovative ways to showcase this beautiful gift of nature in various formats with different artistic techniques: engraving, polishing, monograms, hand painted and more. 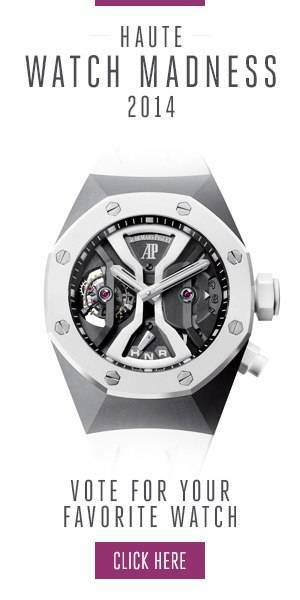 Audemars Piguet is certainly no stranger to the realm of haute horlogerie. Assigning a dainty charm to the Ladies Millenary timepiece, the brand from Vallée de Joux, picks pink gold hands adding that extra touch of sophistication to the stylish off-centered white mother-of-pearl disc, and the small seconds nacre counter. Polished to perfection, bringing out that opalescent character connected with nacre. The Patek Philippe Annual Calendar Ref. 4948G-001 is made in 18-carat white gold case and diamond-set bezel. Driven by caliber 324 S QA LU automatic winding movement, the timepiece has between 35 and 45 hours of power reserve. The shimmering black Tahitian mother-of-pearl dial features gold applied Roman numerals. With an Annual Calendar function, two sub-dials indicate the day and month by hands, whereas the date is seen in an aperture. Moon phases and a sweep seconds hand are additional features against the special dial. Blancpain, well known in the men’s watch world, is also a creator of watches for women with self-winding movements since 1930. The new Chronograph Grande Date by the watchmaker from the Joux Valley in the Jura mountains, chooses white mother-of-pearl face, making the double-disc large date display showing through twin aperture windows at 6 o’clock, look very chic. Even the off-centered time display subdial is made of mother-of-pearl, featuring Roman hour and minute numerals. The 18-carat red gold case houses the Blancpain Calibre 26F8G movement. The Arnold & Son HM Flower Special Editions is a series of four models which comes in a limited edition of only 8 pieces per model. The most striking feature of the timepiece (see image), of course, is the delicate hand-painted miniature design of a rich magenta-coloured orchid in full bloom, which stands out against the glistening natural white mother-of-pearl dial. Photo Credit: Haute Time. For more information, please visit the official Patek Philippe, and Arnold & Son, Blancpain and Audemars Piguet websites. Follow Haute Time on Instagram to catch all of the new releases as they happen.